I just posted a new contribution to the TechNet Gallery. This time it’s a custom control called Affected Items which you can add to any of your Work Item forms to get a consistent way of adding Affected Items. The control also makes the relationship Required, which means that the Analyst will have to add at least one CI to the control in order to save the WI. Here’s some screenshots of how it can look when added to the form. 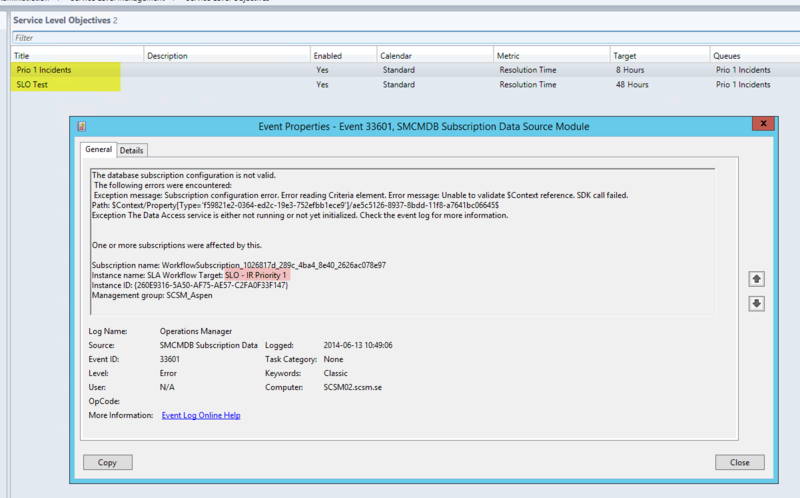 Here’s another useful PowerShell snippet which I created when I built my PowerShell Exchange Connector for SCSM. 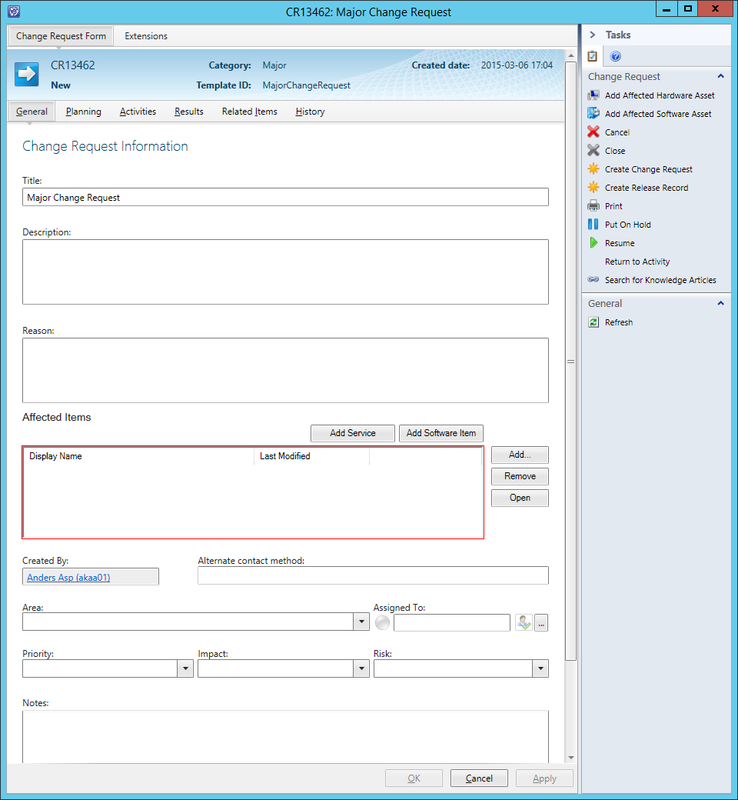 The function itself will return the user object of the given e-mail address. 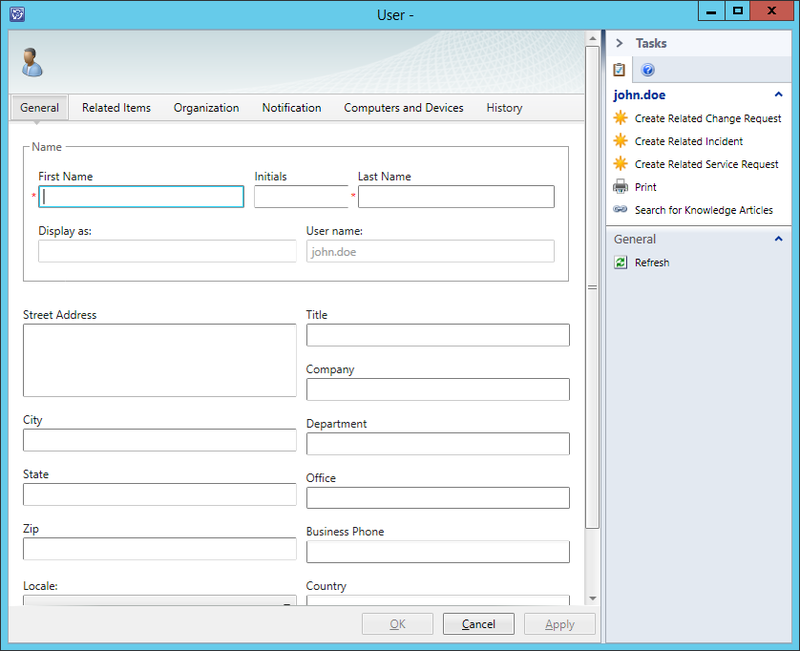 If no user is found you also have to option to create the user object using the -CreateUser switch. $tempUser = Get-SCSMObject -Class (Get-SCSMClass System.Domain.User$) -Filter "UserName -eq $UserName"
Throw "Unable to find a unique username for the new user"
$DisplayName = $EmailAddress + "_SMTP"
I will be posting a series of PowerShell snippets that you can use together with Service Manager. 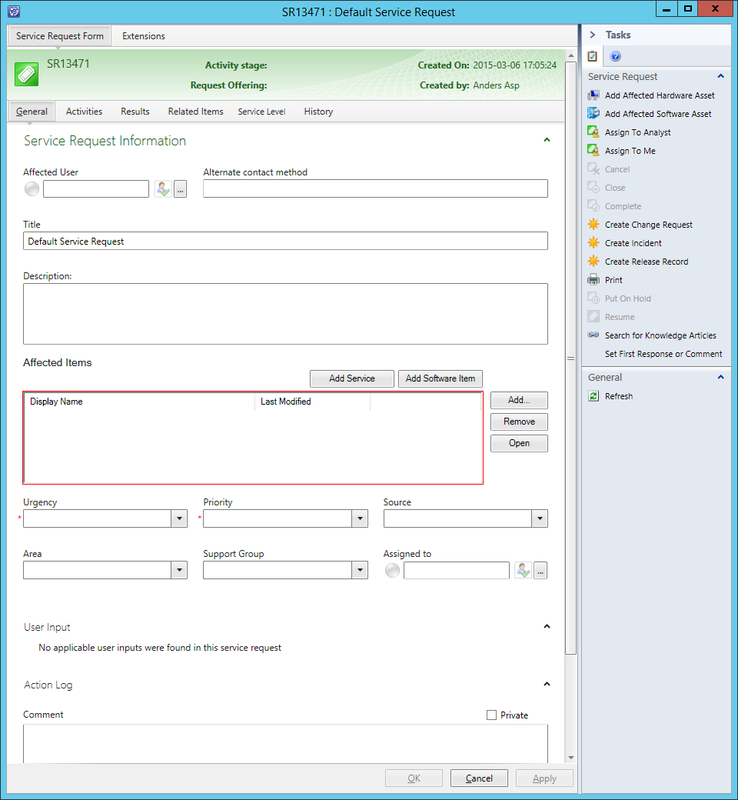 This first one is a function called “Add-SRComment” it is simply used whenever you would like to add an End User or Analyst comment to one of your Service Requests. I’ve been using this a lot when doing automated stuff in SCO and SMA lately. Requires the actual SR object to which you would like to add the comment. Throw "Invalid Service Request Object!" The Exchange Connector is an essential part of almost every Service Manager installation. Some customers however, do not want to create new Incidents/Service Requests upon receving new e-mails, but would rather want the connector to handle updates only. This is not possible to configure in the connector itself which causes some people to think that this isn’t possible. But what can we do about this on the Exchange side? Well, we know that the connector itself will create new work items if incoming e-mails are missing the work item id tag in the subject, such as [IR412] or [SR9122]. If the tag is present in the subject, the connector will update the matching Work Item with the information within the e-mail. So if we can block or reject any e-mails missing the ID tag, the connector would only receive updates, right? To do this, we would have to create a new rule from the Exchange console. 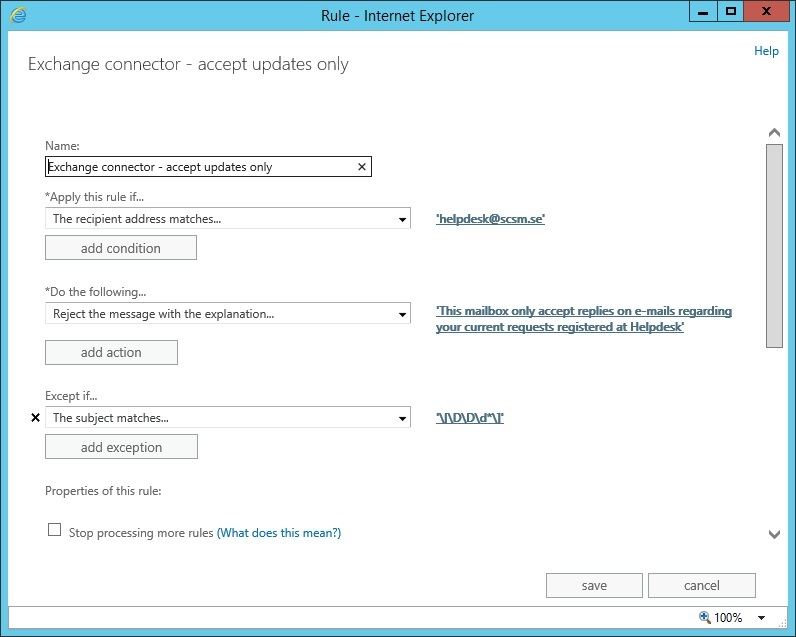 The example below is from my Exchange 2013 lab environment but the same rule is applicable to Office 365 as well. Had a couple of questions on how this could be done in Exchange 2003, see the picture below. Please note that the actual text pattern is a bit different! 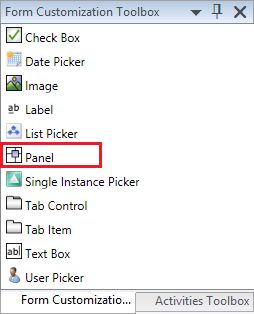 In this post I will go through how to add your users mailaddresses to the Data Warehouse, to be able to display them i reports. 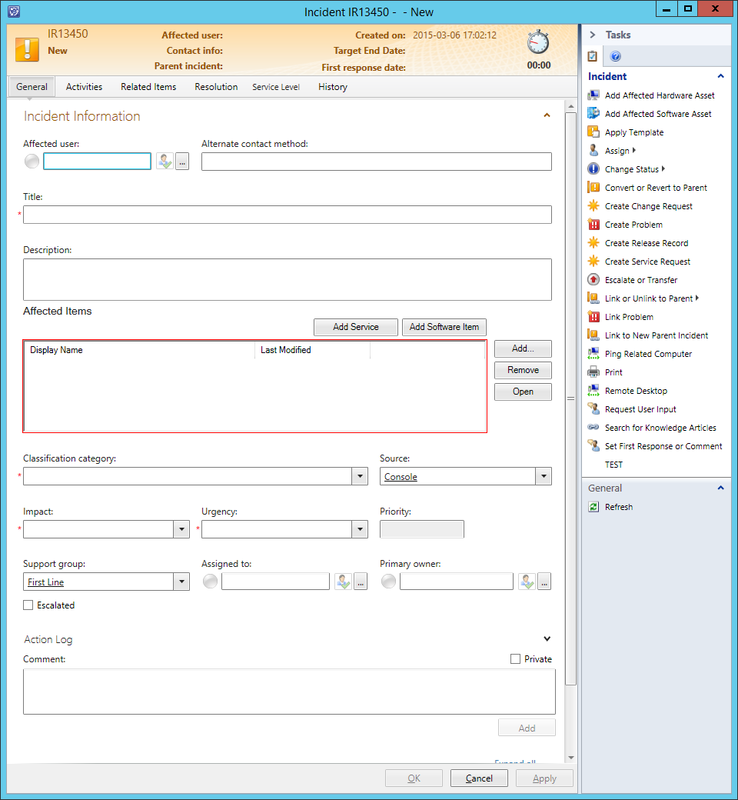 Since they are not transferred to the Data Warehouse by default, we have to build a new Data Warehouse Management Pack to be able to sync this information. But first a quick look how the mailaddresses are stored. They are not simply stored in a textstring directly on the user object as you might think. They are actually stored as a separate object in the class “System.Notification.Endpoint”. This is makes it able to create several addresses on the same user (SIP and SMTP). A relation between this object and the user object is then created. The relation is called System.UserHasPreference. 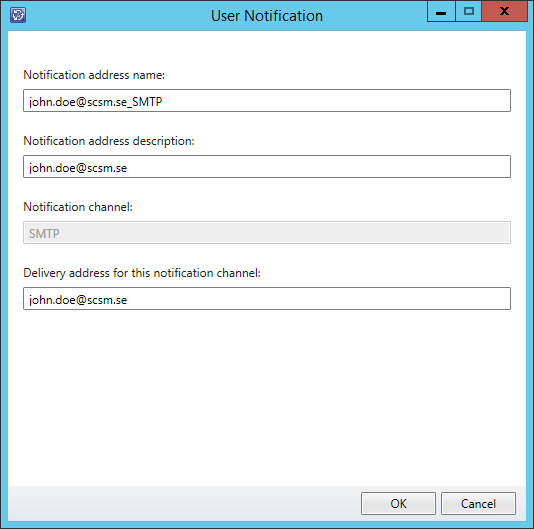 So what we need to do is to define a dimension for the System.Notification.Endpoint, and include the attributes that store the actual mailaddress. Then we also need a Relationship Fact between the Notification Endpoint dimension and the User dimension. Wait for the MPSyncjob in Data Warehouse to kick in (every hour) or start it manually. The MP will then be synced into DW. Take a beer while you wait for the deployment in Data Warehouse. Take in mind that after the Management Pack deployment is completed, it could take a while to populate the tables with the mail addresses. 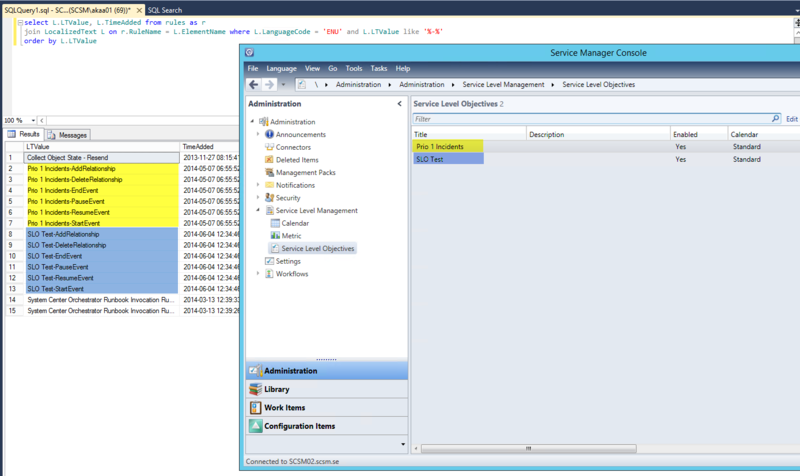 Service Manager is built around storing your configuration in Management Packs. This is a great solution when you’re working with several different environments and would like to move your configuration between these, such as a test and a production environment. Most of the configuration you do is stored in different Management Packs, while data is stored in the database. With this in mind, let’s take a closer look at how Service Level Objectives, SLOs, are constructed. As the picture above displays, the SLO itself is constructed of a Calendar, a Metric, a Queue and a specified Target Time. When creating a new Calendar or Metric, these will not be stored in a MP, instead they will only be created in the database. However, when you are creating the SLO itself, you are able to specify a MP to store it in, so the SLO itself should be stored in a MP, shouldn’t it? Unfortunately not! So what is really stored in the Mangement Pack specified if not the SLO itself? 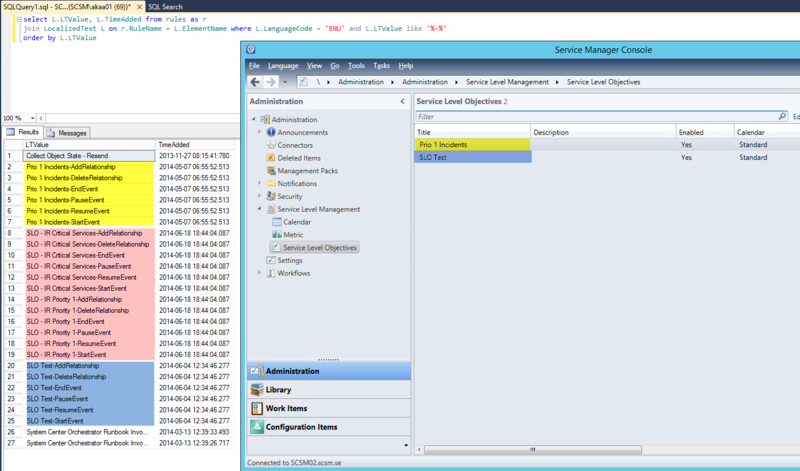 In other words, parts of the SLO configuration and how it is calculated is stored in the MP (yes, the SLO is based upon a set of workflows), but not the actual SLA Configuration object. As a result of this, we are not able to copy SLOs from one environment to another by export/import of an MP since most of the configuration regarding your SLOs is stored in the database itself. If you try to do this, you will end with a number of “ghost workflows” – not visible in the console and related to an SLO that doesn’t exist. Here’s an example of that – in this first picture, you can see my existing SLOs in the system and all the workflows following a certain pattern (that applies to SLO workflows). Note how my SLOs is matching these workflows. 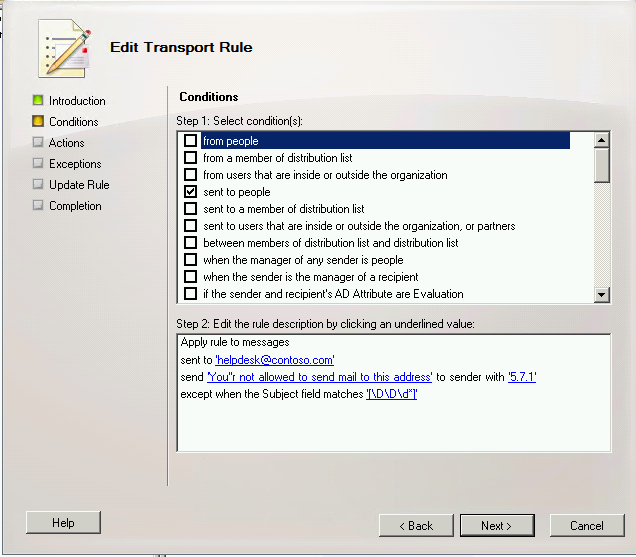 Below is the picture displaying the exact same thing after an import of a MP containing two other SLOs. 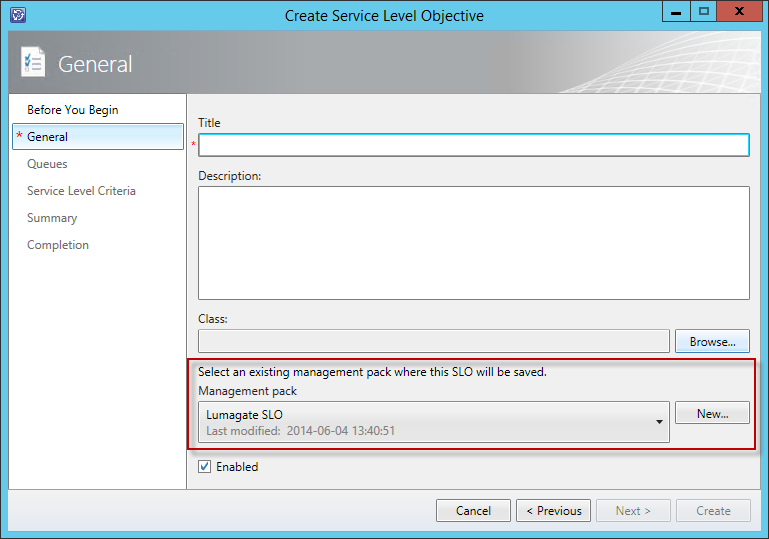 Note that these SLOs are not visible in the console and are not functional at all, yet a number of workflows has been created within Service Manager (marked with red). These are the so called “ghost workflows”. So to summarize: Do not try to export/import the MP containing SLOs to copy SLOs from one environment to another. Doing so will only result in a number of erroneous “ghost workflows” that might affect performance, stability and clog up your event logs with events. In the second part of this blogpost I will try to create a script or runbook that you can use to copy SLOs from one environment to another instead – stay tuned! To all of you who attended to my session at TechEd yesterday – thank you! It was a great experience and I hope you learned something that you can make use for in your Service Manager environment! Now, I promised to post all the queries and links here on the blog, so here we go. -- When and who did the update? -- Which properties were changed in a particular update? -- Which properties has been changed on a certian object? Remember! Changes directly to the database is NOT supported! I’ve also attached the slide deck if you would like to take a look at the slides again.